As real estate agents, we come across a ton of different homes in different neighborhoods with different problems. Such a significant amount of time is spent finding and negotiating for the perfect home that it’s easy to take a break from providing over the top service. I don’t recall a time that I sold a home which didn’t involve sellers who needed to make a series of repairs within a few weeks or buyers who had plans for some improvements shortly after closing. An area where Realtors are expected to bring value to a home purchase is in connecting our clients with reputable service providers. If you are able to recommend a great contractor who can perform great work at a great price, you’re a hero. If you’re unable to recommend someone to help them in their time of need, you lose some status points with your clients. If you are able to recommend a great contractor who can perform great work at a great price, you’re a hero. As any agent will tell you, a “great” contractor is hard to find and even harder to keep. As you begin to refer a reliable handyman, it’s only a matter of months before they are so booked up that getting work performed within a 3 week closing period is next to impossible. Therefore, make a point to constantly update your database of recommended service providers, just as you should update and maintain your client database. Creating a Google Spreadsheet will make it easy for you to access, modify and share your list of recommended service providers. Using the Google Spreadsheets app, you can access this document from your smartphone to quickly reference this list. In the document, set the sharing settings to “Anyone with the link can View” so that you can easily make this link a part of your communication throughout the transaction. 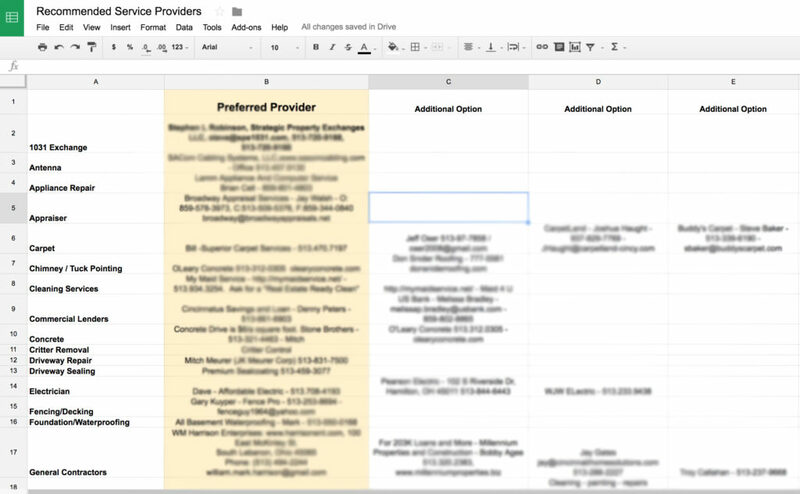 Sample of a Recommended Service Provider Spreadsheet in Google Docs. Some of the best service providers I have found have come from other agents. Whenever you see quick bid turn-around or admire a quality repair job during the walk through, be sure to record the information from receipts provided. This is by far the fastest way to grow your list. At the same time, don’t build this list on your own. If you work on a team or have colleagues in your office, work together to constantly add and refine your list. Make a point once a month to rack your brain for new service providers that you’ve come across. During inspection negotiations, favors need to be called in all the time. 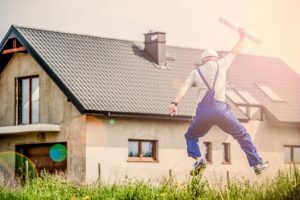 Whether it’s a quick bid to keep the deal moving forward or a last minute repair the day before closing, a loyal contractor can save your deal. Although it’s great to have several options in each repair category, feel free to make one contractor within the group your “Preferred” contractor. Let this contractor know that they are your preferred contractor and do your best to send business their way. When you’re in a pinch and call in a favor, they should be inclined to help you out. A well crafted list can be extremely valuable, don’t keep it a secret. This list can be used as another great reason to reach out to your sphere of influence and provide them with value. Another way to ensure your list reaches your clients is to build the list into an Email Task inside Nekst. Whether it’s setting up an email to go out when your clients are getting ready to list, or scheduling an email to go out with a link to the Recommended Service Providers when the Inspection Period ends, make sure your hard work doesn’t go to waste and your clients appreciate the immense value you bring. Do you have any strategies that help you find awesome contractors? Share your tips below!